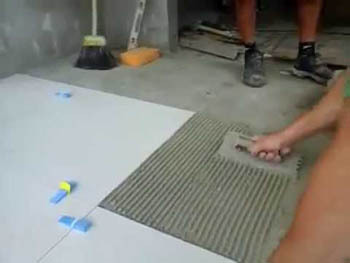 In some places concrete is used before flooring. This concrete is known as subgrade. The places where flooring is done directly on soil, surface should be rammed with the help of wooden hammer, so that the surface should not be settled down. 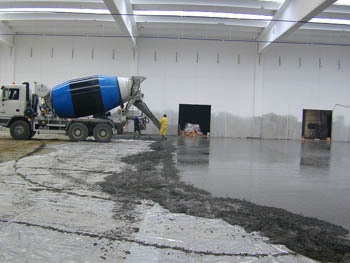 If concrete is used after 24 hours, cement slurry (2 kg cement per square meter) should be laid and then flooring is done. If this concreting is done on ground it is known as base concrete. If it is done on RCC slab, it is known as kusson of size 100 mm and 40 mm respectively. 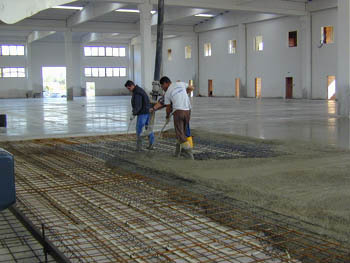 2 ) Cement concrete floor. 3 ) Marble chips or crazy marble flooring. 4 ) Ready made marble tiles flooring. 5 ) Glazed tiles flooring. 5 ) Kota stone, Agra stones etc stone flooring.